I lament the lack of good OLD fashioned Italian restaurants in Perth… in the style of Harry Ferrante and Umberto Tinnelli… and John Salotti from La Casetta in Wembley, where you could get great antipasto and risotto that “sticks to the inside of your stomach.” La Casetta sadly doesn't open for lunch any more. When you are hungry you eat MOST of it!! We have tried Three Coins in Beaufort Street Mount Lawley but it wasn’t up to scratch. So, today we tried Maurizio’s at Italian Club in Fitzgerald Street, North Perth. It started well with a 2 hour parking place immediately beside the front door… but we never imagined that we would need the 2 hours for lunch… but that is another story. The restaurant has ambiance… very nicely set up with great table settings and a general feeling of “class.” But it was downhill from there. I asked to see the Ala Carte Menu… which went from $25 a entrée BOLDLY STATING ENTRÉE’s were ENTRÉE SIZE and main courses were $45 to $70 a pop. So I reverted to the 2 course set menu and chose a tasting plate and a Crisp pork belly. 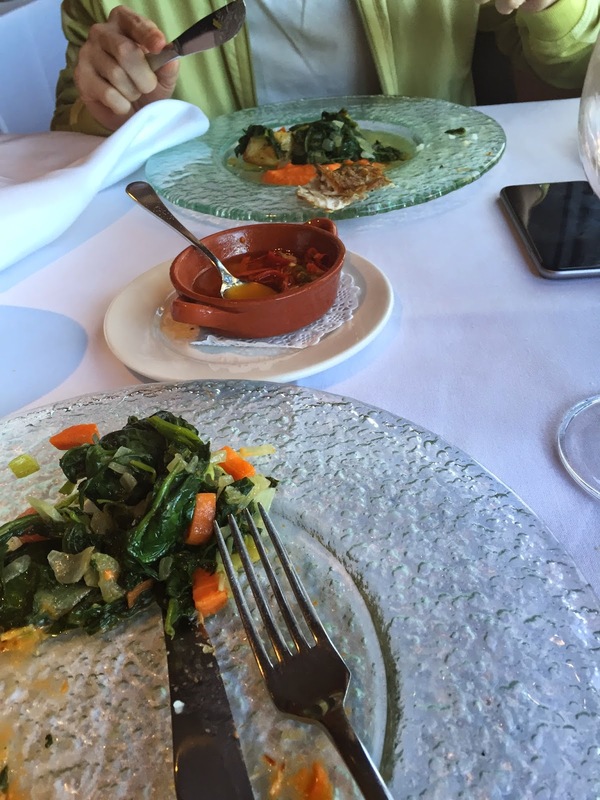 The food was average at best and the service was non-existence… and I worried that the 2 hours wasn’t enough to be served and eat my meal. Brilliant Italian bread saved me from starvation but required 4 servings as the meal took so long. My dining partner had the fish which was dry and his vegetables, although well cooked, were COLD. And in a cost conscious lunch environment, with the addition of a couple of local reds and a bottle of sparkling water, the meal cost $140 which was about a 2 out 5 for value. So, the search must go on for a decent old style Italian restaurant because since Harry has retired they are as scarce as hens teeth. 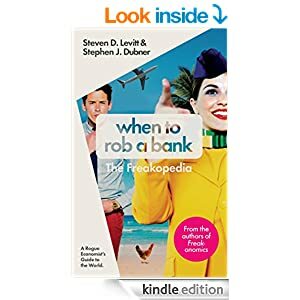 "when to rob a bank" the new book by Levitt and Dubner is a MUST read. Taken from 8000 blog posts, the book is full of previously shared ideas... and Dubner worries about charging for stuff that we readers had access to for free. That is until they drive passed a water bottling plant... where FREE water is bottled and we pay more per litre than we pay for petrol... and he agrees that a curated collection is probably worth reading. And I agree... "when to rob a bank" is a must read. I wonder if anyone has had the experience of being treated as a second class guest... right from checking in?? I booked a night [ Tuesday May 5th 2015 ] through the Qantas site... an offer that came with the confirmation of my flight booking. On arriving at the reception I was asked for photo ID... and the young check in person disappeared behind the wall. When she returned she disguised the fact she had photocopied my drivers licence. I challenged her about it and she said because Qantas was a 4th party booking agent - apparently they use Expedia - it was company policy to photocopy the Drivers Licence... I complained again saying that didn't happen on my previous visit and that I was a Hilton Honors member and they had all my details on file... "Please get me a manager" was my request. Stewart arrived and he was less than pleasant.... I asked to talk to the manager of the hotel and he informed me he was as far as I could get. Asked for an appointment to personally chat with the General Manager so I could record my displeasure... after asking for the booking to be cancelled and being gleefully informed that it was a non refundable booking!! I said I would continue with my booking, reluctantly, but I would like to talk with the general manager... he assured me that when the GM's PA returned he would arrange this. Well a Morgan rang. I presumed she was the GM's PA but no she was someone else... telling me that I had agreed to the terms of them photocopying my ID in case of card fraud. However if I booked direct they would not have that requirement. "Oh you aren't the GM's PA then" Morgan told me " He is VERY busy and I can't get to talk to his PA and I can't get you a meeting the the GM." Well it isn't going so well mate!! I will have left before anyone actually here about my side of the story... that is someone in a position that isn't "covering their arse"
There are many articles and thoughts about the value for 1000 raving fans. The logic is that with this fan base, any idea or business will be a success. The proposition is that any idea you have will have enough support from your 1000 raving fans that it will become viral because your “1000 raving fans” will share it with 3 or 4 people and they will share it with 3 or 4 more… and before long, 10's of 1,000's of people know and support what you are trying to do. The best place to start would be any "entrepreneurial" group of you are associated with like Paul Dunn’s B1G1, Roger Hamilton’s Wealth Dynamics, or a local Chamber of Commerce. If you have started travelling then your fellow travelers to exotic places. And another good source would be your client base from any business you are involved with or had a previous association. And now some practical advice!! From my own experience but more importantly from recently becoming a fan of all things Amanda Palmer, you must start building an email database of your 1000 raving fans and also start sharing with them. You need to involve your raving fans in everything you do and have them champion your cause. 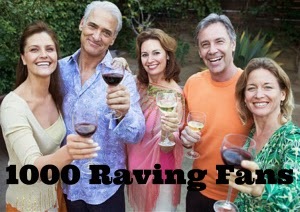 So, who are your first 100 Raving fans... start today.